My sermon from 5th Sunday after Pentecost (July 9, 2017) on Romans 7:15-25a. Listen to the recording at the bottom of the page or read my manuscript below. Section headings in the Bible can be scary and, sometimes, unhelpful. When the bible was first put to paper, it looked different from what we have today. It wasn’t written in English. It didn’t have chapters or verse numbers. And before the invention of spaces between words, each word in the Bible ran into the one next to it. As time went on, and different translations of the Bible were composed, editors added tools to help our interaction with the text. And one of those tools was section headings – these short phrases that describe what the editors think the passage is about. For today’s reading from Paul’s letter to the Romans, different bible translations use different headings to describe what Paul is talking about here. The Message labels all of Romans 7 as “Torn between one way and another.” The New International Version labels this part as “The Law and Sin.” The Common English Bible Translation calls this bit “Living under the Law” and the New Revised Standard version, which we use in worship and which we just read, calls this section “The Inner Conflict.” Section headings are sneaky because they provide a specific point of view that greases the gears in our brains, giving us an interpretation of the text before we actually read. And since these headings are on the physical pages of the Bible’s we read, we sometimes forget these headings are not scripture. Section headings can be helpful but I don’t think they are helpful today because labeling this section from Romans as “the inner conflict” doesn’t jive with what we heard last week. Paul told us in Romans chapter six that we are changed people. In our baptism and in our faith, we are united and connected to Christ. We are no longer enslaved to sin but are now part of Jesus himself. In a sense, our struggle with sin – our struggle with what keeps us separated from God – has been undone because of what Jesus did. Jesus, through the Cross, gave each of us a new subheading describing who we actually are. We are followers of Christ. God has fixed our relationship to the divine by breaking into our world through the life and death and resurrection of Jesus Christ. Paul believed this. Paul knew this. Paul experienced this. So it doesn’t make sense for Paul to write these verses as if the “I” here means him or if this is just some generic I that represents each of us because, through our baptisms, we are something new. So what is Paul talking about here? Well, I think it has something to do with old timey baseball. 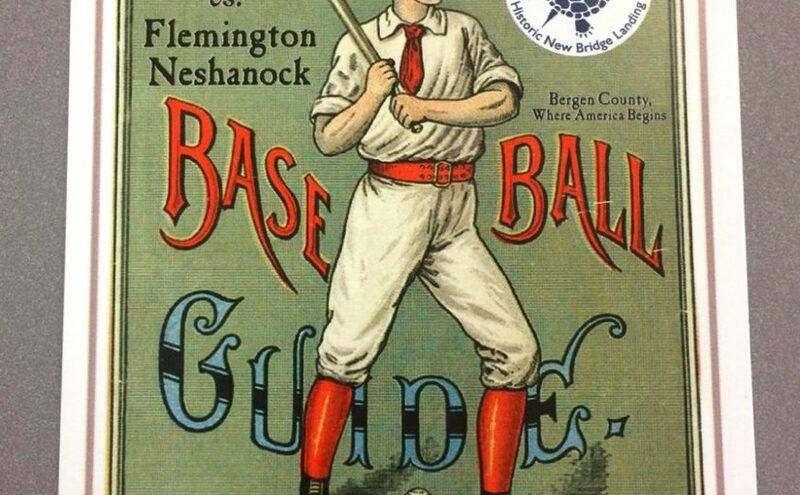 Yesterday, at historic New Bridge Landing, the Bergen County Historical Society hosted a baseball game between the New York Mutuals and the Flemington Neshanocks. The field was muddy. The sun was hot. And the rules for the game were close to what I knew but also….a little different. For one thing, no one had gloves. The teams played by 1864 rules so all ball handling was done by hand. An out could be made by catching a ball after its first hop. And there was an umpire in a top hat and several handlebar mustaches on the players. During the game, one of the Neshanocks would go up and down the sidelines, asking if anyone had questions. Someone near me asked about the number of old timey ball clubs in the United States. And he told us that here’s probably more than 300, with 20-25 along the East Coast. Someone asked if they played tournaments and that’s when his answer got interesting. Tournaments for old timey baseball clubs do exist but this player doesn’t like them. When a tournament is played, teams are trying to win something. They’re trying for a prize or a trinket or even just the satisfaction of knowing they beat a bunch of teams. Once you’re playing for something, the competition heats up and the nature of the game itself changes. For this player, the experience of ball clubs filled with men and women from the ages of 20 to 65 playing by old fashioned baseball rules – loses its identity. It’s no longer a gentlemanly and gentlewomans outing. It becomes just a game they’re trying to win. But, if you’re already playing by 1864 rules, wearing old fashioned uniforms with knee high socks, and you’re having a having a great time, and spending it with friends with unironic beards and facial hair – haven’t you already won? That person, the “I,” in our reading from Romans today is someone in need of a savior. As I shared a few weeks ago, this I is a person trying to solve the Roman problem of the passions. They have emotions and feelings and appetites they believe they can overcome by simply practicing the Jewish rituals that Jesus did. But they can’t because there is a deeper problem at hand. Since Paul’s letter is a letter to Romans, the people he’s talking to here are not Jews. He’s reaching out to gentiles. Now, Gentiles have a relationship with God since God created everyone but they don’t have that special and connected relationship with the divine that the Jewish people have. But God, through God’s own initiative, decided to change that. God’s son lived a very human-kind life, showing everyone just how welcoming, loving, inclusive, and challenging God’s kingdom can be. Through acts of love and mercy, Jesus showed what justice and love actually looks like. And then…the people killed him for it…but God’s love had something else in store for all of us. Paul, in this part of his letter to the Romans, isn’t trying to describe the inner conflict we all have about what’s right and wrong. He’s, instead, reminding the Roman community that their savior has already come. The struggle with following the law is being undone because the gentiles themselves, are being changed. Through the gift of the Holy Spirit, through the gift of faith itself, we are being re-written so that we are a little more like Jesus each and every day. That doesn’t mean, however, that our journey, in faith, is finished. We still have to show up, each and everyday, to the reality of our lives. We’re still going to feel hurt. We’re still going to struggle with the decisions we have to make. We’re still going to discover the ways we cause injustice in the world and we need God to push us to care about the liberation of our neighbor instead of focusing only on ourselves. Paul’s words here sound very real to us because we still need Jesus to help us be Jesus. But Paul is reminding the Romans, and he’s reminding us, that we get to go into the ballgame of life wearing our personal version of a baptized old timey baseball uniform, knowing that the game has already been won. God has done and is doing the heavy lifting to fix our relationship with God. Life isn’t a competitive game that we need to win. Instead, life is about living Jesus-like lives so that the other people around us a – thrive.